The main male protagonist and his teammate a.k.a his older brother. The audition for this blog’s Anime of the Year 2013 award stalled for more than a month due to unavoidable commitments, therefore I took the liberty to replace one of the earlier candidates in the audition, Arata Kangatari, with the recently concluded Ginga Kikoutai Majestic Prince. Some of the other titles I haven’t watched yet that is in the audition, listed at the end of this blog entry, may be replaced too in the near future as the audition progressed. Attack of Titan anyone? In the distant future where our civilization has already colonialize the solar system, humankind was suddenly assaulted by a mysterious alien race that are looking for the main ingredient for that cookbook. As if in cue, 5 troublesome genetically-modified teenagers are given 5 cutting-edge mobile suits and is told to fight those aliens so that the application of that cookbook will not be realized. Taking place in a futuristic space-faring Earth that is engulfed in a war with a mysterious alien race, this anime sure is eerily similar to Gundam AGE. This anime starts slowly, and for me the plot only gets into gear by the time the troublesome teenagers, called Team Fail by their peers in the anime (and me too from now on), finished their second mission. While never reaching the heights attained by the second arc of Gundam AGE; the crusade of Team Fail against the aliens, plus all the things and events they have to cope with being a world-saving celebrities and more, results in a fairly more solid overall storyline than what you can watch in Gundam AGE. 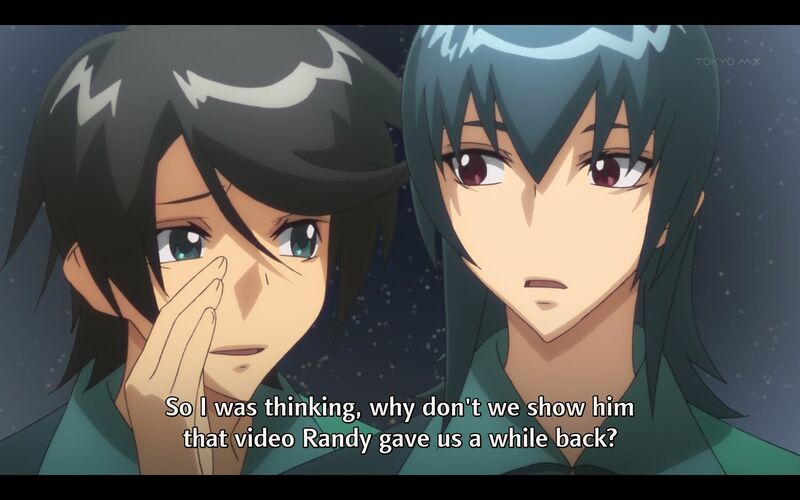 The ending of this anime for example, is exactly the kind what Gundam AGE should have had. First, despite only having only half the episode count, this anime managed to allocate more episodes to the finale events. Plus, there are plenty of action too in the finale, with no ‘accidental’ deaths (or losses) to the aliens’ antagonists as they are predictably kicked out from the solar system. The ending is also structured to have a second season, which as of today, no news about it yet. The ending is definitely one of the positives this anime has. Another surprise positive aspect that this anime has is the lack of the romance elements. When the alien princess first appears, I anticipates a love-triangle between her, the main male protagonist and one of the latter’s female teammates. Fortunately, that didn’t happen and that female teammate may have her chances later if this anime has a second season, as long as she learns to bake a cake he didn’t hate. Would have been awkward if my scenario does happen and we have an ending that is similar to what a certain anime in this year’s audition also has. You know, the one that has 16 episodes and incorporate the domain name of this blog in its title. You cannot have the same positive feelings about the character developments in this anime though, because they (the developments) are mixed bag at best. Let’s take the main male protagonist as an example, where apparently some off-screen character developments has happened between his first and second encounters with the alien prince. During the second encounter, when the alien prince commented that the main male protagonist has improved from his pathetic showing in the prior battle, I exclaimed to myself, “When did that happen? Is there any special events happened of special training routine he has done between those encounters?”. He has not improved at all during the timeline between the first and second encounter with the alien prince. The main male protagonist only has some proper character developments in the timeline the second and the third encounter with the prince, and in the events after that. Not that the rest of Team Fail can be absolved from this problem too. The long-ranged mecha pilot that wear glasses and the pilot that do reconnaissance tasks has static character development, even with the latter’s attraction to the main male protagonist. Same can be said for Black 6 too, but at least he has the excuse of only being introduced at the middle of the series. The oldest member of Team Fail fares better with some developments off the battlefield (see the caption of the screenshot at the top of this review), but not on it. Only the big-breasted girl can actually keep up with the main male protagonist in terms of character developments, although hers starts kinda slowly at first but doesn’t have the off-screen developments the latter has like what I have mentioned in the paragraph above. Best character anyone? But still, if there is a second season, the potential for further character developments is tremendous. One thing that bugged me throughout the series is why no other teammates of the main male protagonist can become as strong as him. There is no reason at all for some of his teammates like Blue 1 and Black 6 to not be able to become as strong as he is. And of course, potential romantic development for the main male protagonist and the surly teammate of his that I mentioned before. The pacing of this anime is actually quite slow for a mecha anime (which is also a negative aspect for this anime), and definitely slower overall when compared to Gundam AGE. This anime doesn’t have the turbulent flow of the storyline that the Gundam title has though, and no scene transitions problems too. While storywise this anime is similar to Gundam AGE, when it comes to character designs this anime is similar to Gundam SEED series (and Kurogane no Linebarrels, Gin-iro no Olynssis and Heroic Age). This not a bad thing of course, and this makes this anime better than Gundam AGE in this aspect. For the first few episodes, I do have problems differentiating between the main male protagonist and his older brother teammate (a common problem for this anime’s character designer portfolio) but I get used to it after that. Has an abundance of black hair, despite the futuristic settings and also the fact that the major characters are GM goods, which is a good thing too. Mecha designs, on both sides of the war is excellent too. Better than Gundam AGE to be sure. Or the whole Gundam series, including the provosionally-impressive Gundam Build Fighters, to be exact. Voice acting in this anime is just average and utter forgettable overall, and Gundam AGE has complete superiority over this anime in this aspect. Damning because the latter isn’t exactly very good at this too. Obviously, no outstanding voice acting gigs can be heard in here. The OST is very good, but the vast majority of the OP and ED themes and also the insert songs is not that way. Only the ED theme that plays in episode 15, 21 and 22 is better than them. That particular ED theme is actually quite outstanding. Animation quality in this anime is good, with only few jerky sequences. Integration between the 2D-like CGI animations with traditional 2D animations is superb. Choreography of action scenes (mecha fights of course) is excellent, even surpassing the ones in Gundam AGE; the structure of this anime’s ending really helps. The director’s problems only lies in the presentation aspects, and nothing more. The job he/she has done is solid, but not more.